Chemicals businesses dependent on raw materials imports are highly exposed to exchange rate volatility and the looming threat of trade restrictions. In line with the recovery of the Brazilian economy (GDP is forecast to increase 2.4% in 2018 and 3.2% in 2019) the chemicals sector is expected to grow by more than 3% in 2018 and 2019. 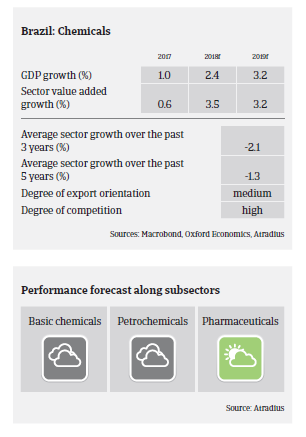 Both chemicals and pharmaceuticals businesses are expected to improve their results and margins further this year. The level of competition in both the chemicals and pharmaceuticals sectors is high and a concentration process is ongoing - in particular among medium-sized and large players. Turnover in the pharmaceuticals segment increased 6.2% year-on-year in Q1 of 2018, up to BRL 11 billion, which nevertheless was below expectations, due to price adjustments below inflation. That said, stable sales growth is forecast for pharmaceuticals in the coming months. Larger drugstore chains continue to expand and to open new stores, increasingly offering over-the counter (OTC) products like cosmetics and selling natural healthy foods. Another boost could be the potential expansion of the “Aqui tem Farmacia Popular” scheme, which aims to improve public access to medicine, offering subsidized products. Apart from a few large players, most Brazilian chemicals and pharmaceuticals businesses are highly leveraged, which is also the result of previous expansion activities before the recession started in late 2014. While being highly dependent on bank financing, financial institutions are generally willing to provide loans to chemicals and pharmaceutical businesses. Payments take up to 120 days in the chemicals sector and average 90 days in the pharmaceuticals industry, with payment behaviour influenced by consumer spending capacity and public sector spending behaviour. In the pharmaceuticals segment, businesses that are serving the public sector and retailers suffered payment delays in 2016 and in 2017. However, the current economic rebound should help to avoid a further increase in late payment cases, and business insolvencies in both the chemicals and pharmaceuticals sectors are expected to decrease in 2018. Our underwriting stance on the pharmaceuticals sector is generally open, as the main market players are rebounding. However, there are still players that could suffer from restrictions in federal spending for public health, while a continued high unemployment rate could hamper higher growth in the retail segment. Our underwriting stance on the chemicals sector is neutral. The agrichemicals sector remains susceptible to sudden changes in important exogenous factors like climate, market prices and exchange rate fluctuations. In the basic chemicals subsector most raw materials have to be imported, and production costs are therefore exposed to exchange rate volatility and the looming threat of trade restrictions. Petrochemicals performance is impacted by higher oil prices (denominated in USD) and currency volatility, leading to higher costs, while demand has not yet fully rebounded.